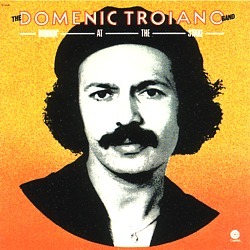 After the Guess Who disbanded, Troiano regrouped and released a new solo album on a new label. This LP was produced by the Brecker Brothers and I use to condemn the album for its slickness and tacky production. Strip away the studio gloss, however, and you're left with a strong set of songs. It's not nearly as organic-sounding as Bush, for instance, but a performer's true talent will always shine through on an album, regardless of who's turning the knobs. "Burnin' at the Stake" opens the album with a bang. No horns, no vocals, no B.S... just four minutes worth of virtuoso guitar playing and furious accompaniment by Dom's backing band; somehow they manage to keep up. If you play guitar, it's enough to make you put down your instrument and take up another hobby, because you know you'll never top it. The song after it, "Peace of Mind," is good, melodically reminiscent of Steely Dan. It has a sublime pre-chorus, and this alone makes it worth hearing ("Jesus once said, forgiveness is divine, if so why can't we find our way?") If I could pick just one song from this album to strip down to its base, "Savour the Flavour" would be it. I've heard the live version of it, and the track sounds better to me with a live groove as opposed to a studio-crafted feel. "Lonely Girl" is a breath of fresh air, quite possibly the best song on the album. It's a quiet, relaxing, jazz instrumental, and a song with little studio polish. Domenic's guitar playing speaks for itself on this one. Last on side one is "Willpower," another motivational Troiano song. "Master of Concealment" is a decent-sounding tune with good lyrics and even better guitar playing. The background singers manage to sneak in at the very end of the song, but only for a short while. "I'd Rather Be Your Lover" is the song on the album that had the most potential to be a hit single. It features Domenic and Roy Kenner sharing the lead vocal, and the result is actually very, very good. "Rock and Roll Madness" is a good song with some great instrumentation from Domenic's band. The song that closes the album, "The Outer Limits of My Soul," is one of Dom's more emotional songs. The lead vocals are sung by Domenic and his then-wife, Shawne Jackson. An unforgettable keyboard line gives the song an almost eerie atmosphere. Luckily, the album ends on a strong note. Guitarist whiz of Guess Who, James Gang and Mandala fame goes solo here on a stellar debut package. Co-produced by trumpet player Randy Brecker and backed by a contingent of stalwart sessions men, Troiano displays a fierce blend of rock, R&B, and soul tinged numbers with his vocals bearing a gritty edge. Best cuts: "Burnin' at the Stake," "Peace of Mind," "Willpower," "I'd Rather Be Your Lover," and "Rock & Roll Madness." Troiano has fallen in with the dread Brecker Brothers and produced a worthless album of repetitious and hackneyed funk. Come back to music soon, Dom. ...As good a fusion album as you're likely to hear. The Toronto songwriter/guitarist came up with an appropriate bunch of songs with challenging arrangements to keep the all-star session crew busy. From the lightly picked jazz touch of "Lonely Girl" to the funk pyrotechnics of the title track and "Rock & Roll Madness," Troiano shows consummate mastery of his instrument. He's never played better than he does here, so he may now receive the widespread recognition that has always eluded him.